If you are launching a small family business and opening a day care centre then you’ll need to make every penny of your investment count. 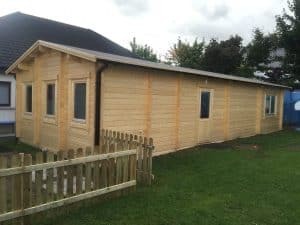 Jude used a space in her garden and bought one of our largest log cabins- The Log Cabin Classroom building. 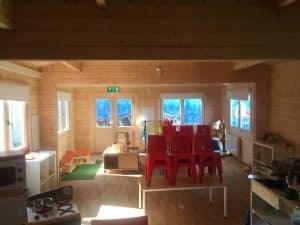 Her Log Cabin was delivered within 8 weeks from placing the order, installation and insulation took another week and her day nursery was opened September 1st! 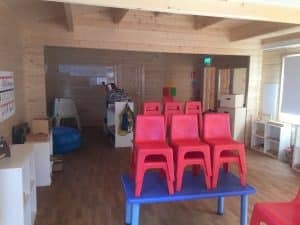 The Log Cabin Classroom building has 9 x 5m main room and three small rooms that she used for a toilet and sanctuary rooms. 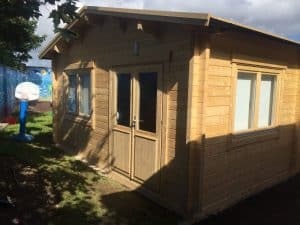 This cabin including baseworks, installation and insulation can be assembled within a £30,000 budget and could be used as an office, showroom, conference room and in many other ways.